Do you build a business around yourself or do you keep your name and personality separate? Chris Ducker has done both, with great success. Find out what he has to say on the topic in this interview. 07:33 – Stay in the background or build on your personality? 12:57 – Why bother with Youpreneur? James: James Schramko here, welcome back to SuperFastBusiness.com. Today, I have a guest who’s been on before and is still coming back. Welcome back, Chris Ducker. Chris: It’s good to be back mate. I’m just happy that you’ll have me back. This is great. I think this is my – is it my third time on the show? I think it is. James: Well, you’ve been on the show plenty of times. One of the reasons I think, you had a book called Virtual Freedom, which was something we spoke about. You also spoke at one of my events. James: So, we had you talking about that, which is probably along the same sort of lines, Episode 335 was called Chase It Down, I think that’s one of your sayings, with Chris Ducker. James: We had Outsourcing Like an Expert in Episode 392. We had Episode 292, was Virtual Freedom with Chris Ducker. You’ve had mentions in other episodes, but you’re basically taking up a fair bit of media on my site. Chris: So this is the fourth. That’s good. I’m proud. James: Yeah, you’re doing well and we have to a large extent a symbiotic sort of audience. Your tribe and my tribe have a big sort of concentric circle in the middle there where they cross over. Chris: They do, they do. James: I was happy to speak at your event in Cebu there. And from that event sort of spawned my book, Work Less Make More, was sort of derived from the presentation that I gave that really got one of the audience members, Kelly Exeter, excited about helping me to write that book, which is astounding. It’s not a task you take on lightly, as you well know, because you’re just at the stage now where you have your next book coming out. So, I spoke at your event, you spoke at my event. We’ve been on each other’s podcasts. We share lots of customers. I think it’s fair to say that in any sort of expertise, someone is going to be subscribing to multiple solutions to round out their education and to get different exposure. And I wanted to cover a few different topics today with you, because it’s a great opportunity to speak to someone who’s doing some pretty cool stuff above the line, but also behind the scenes. And I wonder if we can get some insights into that today, Chris. Chris: Yeah, let’s do it. Chris: It was like, no, that’d be the end of my fourth time on the show. James: Well, first cab off the rank, you’ve gone out there and followed up your best-selling Virtual Freedom book with Rise of the Youpreneur, which is subtitled, The Definitive Guide to Becoming the Go-To Leader in Your Industry and Building a Future-Proof Business. This was an interesting title for me because of reasons you would not be aware of. The future-proof business part – it always makes me chuckle, because in 1993, I worked for a company called Vodafone, and they were introducing digital telephones to the Australian market and as part of their spiel they said these digital telephones are future-proof. Now, if you got your hands on an old Ericsson GH 172 brick or whatever we were selling back then, you’d chuckle because it’s nothing like the iPhone X that’s sitting on my desk today. So, future-proof is a pretty strong argument and that’s where the book has to deliver on the promise. So, tell me, how did that get its way into the subtitle? Chris: Well, I think that realistically, it actually came to me from a member of the Youpreneur community, where we had just wrapped a one-day workshop in London, I think probably middle of 2016, May 2016. And this guy Mark from Belgium came up to me afterwards and he said to me, “You know, what you’re doing here is you’re teaching me to become future-proof in my industry. And he started kind of reiterating some of the things that I’d gone through during the day and some of the things that he had seen me present on stage at an event in London earlier that year. And that was, when you build the business around you and your experience, regardless of what industry you’re in, it doesn’t really matter. You ultimately become the business and you become 100 percent uncopyable at that point, because you are the unique factor. And by doing that, at the very core of what that’s all about is you become future-proof. I mean, that’s kind of the basic entity of it. And what it means to be future-proof is to ultimately not be affected by things like referendums or presidents or world-changing events and all that kind of stuff. It comes down to ultimately being 100 percent in control of your business, and you can do that if you are the business. So, for people like coaches and consultants and speakers, authors, content creators – these type of people that are building a business based around their experience and their passion and the people that they want to serve, it’s a very attractive term to hear. Hence the fact it worked its way into the subtitle of a book. You know what I mean? He said, “Get skilled.” Because if you build up your skills, if you read your business books, if you work your way up your expertise ladder, then you’ll be able to get income very quickly. You’ll be able to take that asset with you if you change jobs. James: So back then, he wasn’t talking about building me as a brand. But he was certainly talking about taking that knowledge with you, and that’s why I always considered buying business books. A real investment. Of course, you have to read them and take action on them as well. But it’s a great way to build up a core asset that is portable, and you’re just applying this here in a business sense, where every effort that you do to further your authority or presence in the market or differentiate yourself with your unique flavor, it makes it harder for people to replicate you. And I guess, firstly, do I understand that correctly? James: OK. So that being the case, with every big positive is a negative and with every negative is a positive, because you can’t have light without shade. James: In your book, you talk about the other approach, is to build a business that is more or less putting yourself in the background. And you talked about how much harder that can be, to build a business where you’re not the personality. I think it’s fair to say that it generally takes a bit longer. It is much harder to defend yourself from competitive attacks. But the cherry on top for some is that it might be a saleable asset. Or the business might grow on to be bigger than the founder, which might be the case with something like Amazon or Facebook or Apple, where the founder’s no longer with us but the business continues on. Where do you think that seesaw is between building a business that doesn’t have you at the front versus having you front and center and more or less creating an unsaleable asset? Chris: Yeah. I mean obviously I have done both. I follow both business models. I still own a very – in fact, really, two good-sized businesses. One of 400 employees, another one of 20 or so within the outsourcing world. In terms of the Live2Sell Group and then Virtual Staff Finder, my face is not synonymous with either of them. I probably work no more than an hour a month on both of those businesses but yet they bring in a multi-seven-figure revenue each year. So, I’ve done that part of not being front and center. With youpreneur.com and everything around that, obviously I am front and center, because that’s the business model for that particular business. In terms of sort of creating an asset that ultimately can’t be sold or would be very hard to sell at some point in the future, I think the very aspect of being a youpreneur and creating a business around you and your expertise and your personality, I mean that kind of just shows that that’s a nonstarter, isn’t it? Like you know, you wouldn’t necessarily create a consulting business based around you and your experience because you kind of foresee yourself selling it at some point in the future. So, I think it’s a valid discussion point. But I don’t foresee a lot of people that would potentially read Rise of the Youpreneur wanting to do that at some point. You know, the easy – well, we use the word “easy,” it’s probably overstretched a bit. But you know, a slightly simpler way to be able to look at this is well, OK, I won’t use my personal name as I’m building a business. So, it’s not going to be chrisducker.com. Maybe it could be youpreneur.com. Now currently, with everything youpreneur.com, in terms of the site, the community, the live events, the book, the high-end masterminds, you know everything that goes along with that brand, for me personally, I’m very front and center all the way. But because it’s a brand name and not my personal name, I could potentially at some point in the future, if I wanted to pivot and spend less time in the limelight, so to speak, for that business, I could start doing that if I wanted to. Just like I did with Virtual Staff Finder. When we launched Virtual Staff Finder in August of 2010, I was bang smack in the middle of the whole thing. I mean, it was what I was known for. I was known as a VA guy, as the outsourcing guy. So, I obviously leveraged that personal brand to be able to get that business off the ground and get it rolling. And it was probably not until late 2014 that we kind of removed my face and my name from the website and all the rest of it and it started to kind of stand on its own two feet. So, there is an opportunity to pivot away. Unless it’s in your own name, and then it becomes obviously a lot harder. James: Yeah, it’s a good discussion and a good distinction. I’ve done the same thing with SuperFastBusiness. I’ve built SuperFastBusiness as the brand and SilverCircle and I was able to sell my SEO business, SEOPartner, and SuperFastWebsites, which we renamed actually as part of that pivot to RecommendWP. I was able to move those businesses away from me and sell the teams that went along with it and the systems and the IP and the domain names to buyers because they worked without me. So that is a very important point. I think some people do lose that point, and they are most definitely building unsalable businesses. That would be my absolute prime concern or consideration for someone, and one of the questions that I have when I diagnose people for their first onboarding for any kind of coaching, I ask them if they’re intending to sell. Because I think you make different choices if you plan to sell the business versus having a cash cow that’s unsalable. A Hollywood actor, for example, is a great example of a youpreneur who’s built their name from acting roles. And they’re not future-proof if it turns out they’ve been naughty. They can still untuck them. However, I think just lending your personal brand to a business is a nice way of getting that – like Jobs did with Apple, like Branson does with Virgin and you know, there’s lots of examples, like Buffett does with Berkshire Hathaway. You can push that personal authority onto a brand and power it up and then you could later on sell it if you want. So, that sort of helps someone like me feel better about building up a personal brand, knowing that you can step back and sell the thing. So, I’ve avoided putting too much emphasis on my personal brand until now. But someone listening to this might think, Chris, you spend an hour a month and make seven-figure revenue. Why would you even bother with the Youpreneur stuff, which will obviously pay OK, but definitely it’s where your attention is, if you’re following? You have a constant commitment, almost a job-like presence on social media, when you decide to go down this Youpreneur path. Do you ever find that you’ve lost touch with your personal life and the lines are so blurred that you’re always at work now, always performing, always thinking about your audience instead of thinking about what you’re doing for yourself? Chris: No, never, because to be honest with you, after 14 years of entrepreneurship, I’m having more fun doing this now than I ever have done before in my career. You know, just like yourself I come from a very corporate sales background, full of targets and you’re only as good as your last sale and you’ve got to work your way out of slumps and all these kind of sales sayings and phrases and all the rest of it. And you know, when I set up my first consulting business in 2013 now, it was hard, man. It was hard work. And even though it’s become easier over the time – I mean, as you know, I hit burnout in 2009 and recovered from that – it’s been a tough journey. Maybe I’m getting old. I don’t know. But you know, I’m to the point now where I’m very blessed to be in a financial position where I don’t have to worry about having to pay the bills every month, where I don’t have any debt and where I’m very comfortable. And so for me now, for what I do from a day-to-day basis business-wise, yes, I’m going to make money. I’m a business owner. I’m an entrepreneur. I like making money, I’m quite vocal about that. I’m quite selfish about that. But the fact of the matter is that I might not necessarily have to make as much as other people in my age group or my industry or whatever. I mean, don’t get me wrong. Youpreneur will be a very, very profitable business in the next 18 months to 24 months. I mean, it’s already a profitable business right now, don’t get me wrong. But we’ll be making a lot more money, two years from now, than we are right now, with growth plans and expansion plans already in place for a little bit of an acquisition and a few other bits and pieces that we’re looking at. So, it’s not like I’m not making any money. I’m making very good money with Youpreneur as a business model. But for me, at this point in my career, it’s not about the money, believe it or not. It’s actually about doing good work serving the right type of people and having a bloody good time in the process. And man, I’m just, you know, I’m having a lot of fun, James, which I know you’re a big fan of. I’m having a lot of fun. It might look like I’m kind of nonstop trying to pump out content and all the rest of it. But as you well know, the power of a good team can make a lot of that seem very, very seamless. And it is, for me personally. Probably 70 percent of what you might see me doing on social, for example, is not me. It’s my team. And the other 30 percent will be the slightly more personal stuff, obviously, that I share when I’m out and about – Instagram stories and all that kind of stuff. So, I think that as long as you’ve got the balance in regards to the way that you’re delivering whatever it is that you’re delivering to your market, and you’re having a good time doing what you’re doing, then you’re in a good position. It’s nice to make a lot of money. We do just fine, we’ll do even better. But for me at this point in my career, I’m about having a little bit of fun. James: I think it’s great to have fun. I wonder, if you’re in a position where you don’t have financial obligation and you do have time freedom, if you can still connect with an audience who definitely have time pressures and financial constraints. How do you stay relevant to them when you’re in a different position in life than your average prospect, who I imagine for a book like yours, a lot of these people are probably fairly new to the market and exploring options other than working a job with someone, a typical sort of scenario. Or they might be an artist or a blogger or someone who’s quite talented and looking to magnify their presence. How do you connect with them and make it relevant for them? 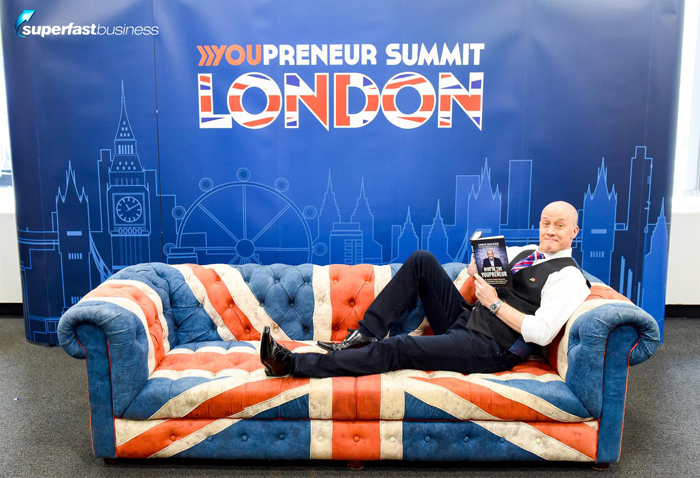 Chris: Well, I think you’ll find, actually, based on the people that I’ve already given the book to have read it – and I gifted almost 500 copies of it to the attendees of the Youpreneur summit, which was held last in London, as a bit of a surprise. Prelaunch, soft launch, whatever you want to call it. And a lot of people were at that event and have read the book and gotten back to me on it. They’re a lot further along than you might think in regards to their career, in regards to earnings, in regards to opportunities. But the fact of the matter is that they’ve never really, truly taken the whole personal brand business element that seriously. They consider it the wave of the future now based on what they’ve seen from me and what they are seeing from other people in the industry. So, although they don’t necessarily have big strong personal platforms online or brand platforms online, there are actually a lot of them quite very heavily accomplished entrepreneurs. But I mean in terms of being able to keep relevant to them, man, it just comes down to one thing and this is one thing that I know to be very, very true in regards to serving people, and that is to listen. I learned that a long, long time ago in my sales career. You will close five times as many sales if you just shut the hell up and listen to your prospect and then go ahead and deliver what they need. And so that’s what I do. That’s how I stay relevant for them. If they need help on learning how to utilize social media properly to manage their reputation, their brands, that’s what I’ll put together for them. If they want to get together in person and mastermind, then hell, I’ll put on a live event for them. That’s genuinely what I do. I’m just a very, very, very competent listener, which some people might find quite hard to believe and accept, because I’m more of a talker than anything else. But the fact is that I listen at least twice as much as I talk and it’s served me very, very well in my career. James: Yeah. I think there’s the surface level Chris and then the Chris that you get to know on a deeper level, which I’ve had the interesting experience. I think on our very first time we met in a cafe in Sydney, I commented to you that you look much younger than you do in your online pictures. Chris: That’s right, and you grabbed my phone. I remember this now – you grabbed my phone and took a new Twitter profile photo for me there and then. I remember that. James: Your picture looked like an older man than I was meeting at the cafe, which is the opposite of what happened to me when I met Ken McKenzie, he’s a fantastic member of my community. He was the first guy I met from a forum about 12 years ago. I still had a job and we were both members of a community called XSitePro and we arranged to meet at a cafe. And I went there and I couldn’t see Ken anywhere. All I saw was this old guy and I’m like, “Ken?” And he goes, “Yeah.” He was using a picture from, like, 20 years ago. And he’s going to send me an email with caps lock after this podcast as my punishment for sharing that story. But it’s really quite funny when you, sometimes, you meet people in real life, they’re not exactly how they appear online. You know I’ve got to know you. Like, one of the things has always made me curious is why you don’t talk about the massive business you have in the background, because for most people that would be a tremendous story to build confidence in their customers that you know what you’re talking about. And it only really hits home when I see your Christmas picture with 400 employees in one room. I know what it was like when I was meeting my team at the time. With 60 or so people, we’d book out a restaurant, but 400 people – you must look around that room and think, goodness me, what a responsibility. Chris: It is, it’s huge. And I mean, I have decided that I’m going to start talking more about that side of things. I actually had a very long discussion with my wife about this at the end of last year, and we are going to start talking about it a little bit more publicly. And you’re right. I mean, it’s a huge responsibility. I remember actually back in 2012 where we only had maybe, I don’t know, 250, 280 or so people working for us. I had to go in for back surgery and a lot of my management team, of which at that point there was probably around about 20 or so, kind of all pushed their way through the visiting hours into my room the day before I was having my surgery done. And my surgeon just happened to come around to talk to me as they were all in the room before they got kicked out by hospital security, because you’re only apparently allowed to have two visitors and I had about 20 people in the room. And he walked in and saw these, obviously, these Filipino faces as a Filipino surgeon himself. And you know, he was talking about procedure and everybody was just kind of listening very patiently at the end of the bed and all that. And as he was leaving, one of my campaign managers turned around and said to him, “Hey Doc…” you know, in Bisaya or Filipino dialect. She said, “Hey Doc, can you please make sure that you look after our boss, because our families need him. We need him. Take good care of him.” And although I’m not fluent in the dialect, as you know, I know it quite well. And so I picked up about 70 percent of it, and you know, it really hit me. And he turned around and he said to me, just before they put me under, he said, “Don’t worry, you’re in good hands. I’m going to take care of you. You may have a couple of hundred people working for you but you’re actually feeding probably two or three thousand mouths.” And it kind of just like, holy moly. When somebody says something like that to you, it really kind of hits you. So yeah, the responsibility is there. But you know honestly, James, through the years as we built that business, I’ve only focused on two things. Number one, most importantly, providing an incredible service for our clients so we minimize customer turnover. Number two is to treat my employees so bloody well that they never want to leave me so I minimize employee turnover and keep that retention there. And in an industry here in the Philippines, which has an annual staff turnover rate of 65 percent – which is horrific to say that out loud, but it is 100 percent true – 65 percent of all BPO employees will go from one job to another on an annual basis. At the Live2Sell Group, our retention rate has been nine to 10 percent pretty much every single year that we’ve been in business. I’ve got managers that have been working for me now for eight, nine years, and the reason why is because I genuinely give a crap about them. It’s really that simple. I care about them and it’s a two-way thing and the responsibility is there, you’re right. But you know, you shouldn’t take the responsibility for granted nor should you kind of flaunt it around, I believe. You know? James: I agree too. We’ve got a team of five now, and the most recent person to join our team started seven years ago. No one leaves. James: They don’t leave unless – the last person to leave left because he, over the last seven years, got inspired and started his own franchise. You know, life insurance business. He took a franchise and he’s growing it. You know, obviously a hypergrowth market over there. And I celebrated it with him. You know, well done. He’s on that journey. And the team just get better and better every year. I love the team. I think it’s really important what you said about them supporting other people. I’ve always figured it’s about six people, just from my experience. I know almost certainly they’re sponsoring siblings or nieces and nephews through formal education. James: And they’re most likely paying for Mom and Dad’s grocery bills and medications and utility bills, almost certainly the people in the sort of business that you and I have. Chris: Even as far as grandparents as well. James: Oh definitely, grandparents. You can learn a lot from their culture about how they support each other. James: It is a big responsibility, but it’s a good thing to do. You can feel good about that. So on a similar worded topic but completely different, one of the references in your book, it’s kind of dealt with in a paragraph and it’s something I’ve put a lot of time and attention into. But you said, don’t build your online home on rented land. And for me, I’ve had a similar expression, own the racecourse, not the racehorse. James: Tell me your thoughts on that. Do you see people doing this often, where they just build out one page or something and that’s it? Chris: Every day. Every single day. It’s bloody ridiculous. Every single day I see it, whether it be building your community around a Facebook group or whether it be building a YouTube channel full of content or putting together, you know, videos that…. It’s just stupid. It’s a stupid business model, and I’ve been saying it for bloody years and years and years. That it’s a silly idea to build your own house on somebody else’s land. I mean, it doesn’t matter how great your Facebook group is. Let’s go with that as an example. It doesn’t matter how engaged it is or how many people are in there. You don’t own it. Zucks does, and him and his team can change things whenever they want. They can move those goalposts whenever they want. And they do it very regularly. And it’s just, you know, it just scares the bejesus out of me whenever I see anybody doing something like that. It scares the crap out of me. It really does. And I know actually somebody who was charging for access to a Facebook group about a year or so ago, and she had a good 5,000 or so people and she was making good multi-five-figure monthly revenue from it. And she got the group shut down. Not because of something that she did, but something that one of the members of her group posted. Just overnight. Boom, done. There’s your business gone, up in smoke. I mean, your analogy of owning the course and not the horse is just utterly bang on perfect, because that’s exactly where you want to be. The course ain’t going to go nowhere. Horses will come and go. And so, I just think that, particularly when we’re talking about the personal brand business model or the Youpreneur business model, you’ve got to build out your own home. You’ve got to understand that yes, you utilize these platforms like Facebook and Twitter and Instagram and YouTube and everything else that’s out there. Utilize them for what they are, and that’s marketing arms. They’re different parts of your marketing department. That’s the way I look at them. And I know that my YouTube channel could get shut down tomorrow, and it wouldn’t affect me all that much. I know that I could be booted off Facebook tomorrow, and it wouldn’t affect me all that much. Because everything that I do is focused on getting people to my online home at chrisducker.com, getting them onto my email list by offering them a high quality opt in, and then providing value to them on a consistent basis. But yeah, it’s mad that it still goes on, but it does every single day. James: Speaking of community, I remember when we were at your Tropical Think Tank, we had a speakers’ day before the main event and you were pretty curious about the subscription membership model pricing and how tos. And we spent a fair bit of time talking about it. James: And I’ve watched that be born. James: And I noted with interest you had a membership model as the poster child of recurring and predictive income. Some of these quotes will probably make it as tweetables. I hope we’re not going to impinge your copyright there. But how has the community been? A lot of people in my community are looking to set up or already have a community. What sort of growing pains or challenges have you had from the idea of having a recurring community to where it’s at today? And I noted your earlier intention to make it bigger over the next few years – like, what has that journey looked like? Chris: Well, I think what we’ve struggled with above and beyond everything else is the same thing that everybody or almost everybody struggles with, with any kind of recurring business model, and that’s a certain amount of churn. You know, people will only stick around for a certain period of time and we’ve tried a lot of different things. You know, when we first started out we were offering a monthly and an annual option. Then we went annual only, and then we went monthly only, and now we’re back to monthly and annual. And that’s the model that seems to work best in terms of offering people the opportunity to either sign up for a month or sign up for a year and sort of get a few months for free, sort of type of thing as part of the deal there. But other than that, the only other real kind of consistent problem, which is not so much of a problem anymore now because of the numbers that we’ve got inside of that community, I think we’re up to around about 700 or so members now… What we did have a problem with, you know, not out of the gate, we did very well in regards to community engagement out of the gate. Because everybody is excited, or you know, they’re all hot to trot so to speak. But I noticed after round about six months or so, engagement was dropping off a little bit. There weren’t as many new discussions being begun or started rather, inside of the community software. And so, you know, it really did fall on us as the community leaders to spearhead that conversation and to ultimately make sure that people were in there on a regular basis. And like I said, over time as we’ve grown the community, it has become easier for us to keep that conversation going on certain threads and on certain topics compared to where we were sort of out of the gate. But I think that will probably be the same for anybody that’s been growing a membership for any period of time. One thing though that I can say is that when I launched Youpreneur as a community back in late 2015, I genuinely wanted it to be kind of the business model for Youpreneur as a brand. And it’s very much still in the center of what we do. But clearly it wasn’t going to A, make the kind of money that I wanted to make with it and B, it wasn’t going to serve everybody that I wanted to serve in a kind of complete fashion. Like, it was obvious. After maybe a year or so, it became very obvious to me that I was going to have to do other certain things such as hold live events and write the book to get the word out further and all that kind of stuff. But overall it’s been a very, very pleasing experience. I haven’t had any quote, unquote negative feedback or any negative kind of topics or issues arise from launching and building it. But sure, it was certainly a little tough here and there, but like I said, at this point we’re in a position where the conversation does flow very easily and it’s a real pleasure to go in there every sort of, every other day, which is what I do. James: If you get into double-digit churn, it’s going to kill the membership or subscription business. And we could learn a lot from software as a service businesses who have all kinds of churn calculators and things and ways to help people use their products. Because they know in that freemium model, if they don’t use the products they’re not going to engage or sign on. So we can also be instructed and informed by lots of the programs that we have purchased ourselves, like which programs have we upgraded or paid for or continue to pay for and would rather not see leave our world? They’re the sort of things we have to think about. Why is that the case? What is it about that? And one thing that I think is really interesting is how you talked about engagement. Because it’s a conversation that must include context. There are most definitely different kinds of engagement, and to sort of highlight this, in the last week I flew to Brisbane and then to Melbourne and then tomorrow I’m going to the Sydney meetup. So from just those three touch points, I will have seen probably a fifth or so of my own members face-to-face in a live situation. I truly know my customer when I’m speaking to them for a few hours over dinner and that connection. So, I can see a massive plus. If you’re going to run an online membership community, live event components are critical for reducing churn and building that sort of revered tribe status. You’ve spoken at my event. You get the vibe of what people are like after coming to seven, eight, nine, 10, 11, or 12 of these things. James: They become a family. Fascinating to watch that, and I wish you the best of success in the future. But certainly a lot of people listening to this need to hear that, even with a big audience and following like you have, there can be some challenges to convert likes and love hearts to dollars. And I think to some extent this might be something that Pat Flynn’s also experienced where he has a massive following and then converting them into products and services, it’s still a slightly tricky process and it’s best to get some help with it if you’re not sure because you can really save yourself a lot of stress and pressure. I think what you just said there will really help people understand. Definitely go into a recurring situation with reality at stake. The enemy is churn. That’s the thing you have to solve. If you can solve that, and two ways to get there, to make your product or service more useful. So, to help people get results. And the second part is to make it easier to use, which is more a usability issue. It’s about seamless logging in access via app, those sort of things, and notifications when a behavior happens. So they’re the go-to tips that I help people with. It’s fascinating to hear you’ve changed the subscription terms a few times. It’s a conversation that comes up an awful lot in our own community, is pricing frequency and different ways that you can make it favourable for people to stick around. Chris: Yeah. And you’ve got to test. If you’re not testing then you know, you’re not learning. That’s the way I look at it. And so, not only did we try different models, but we also had different price points as well. Where we’re at right now, $59 a month, $549 a year, understanding that the majority of people – when I say majority, I mean the 70 to 80 percent of these members – are the smart people, but they’re fundamentally at the beginning of their personal brand business journey. They might already have a blog in place or a podcast in place; they might already be coaching and working with a certain amount of clients. But ultimately, they’re really at the beginning of taking it seriously from a business perspective. And we have found that those price points kind of keep out the naysayers, they keep out the time wasters, they keep out the big churners, and they allow us to attract the right type of person. And our average, I haven’t looked at it for a while, but I mean from the numbers in 2017, I would say our average tenureship for anybody joining on a monthly plan is probably six to seven months on average, which is pretty darn good considering the industry average of turnover, around about three months or so. But obviously, we do try and pitch and promote and kind of focus on the annual side of things, just like anybody would do. But to say that we keep people around for six or seven months before they do disappear is something I’m quite proud of based on industry standards and everything. But it is not just about models, it’s about price points as well. I think we’ve found our sweet spot with where we are currently with that. James: Cool. Well, it’s certainly a good start. I might share something with you later. We’re sort of running around one to two percent churn, so in our membership we’re seeing almost three years’ retention. James: It’s quite a lot more than the… I don’t know where this average of three months comes from, but it’s just clearly not enough. I think you probably tripped over one of the solutions is to have longer subscriptions, but it definitely goes beyond that. And I wonder if you found the annual subscribers are a different type of customer than the monthly’s. Chris: Honestly, they just tend to be a little bit further along in the journey, and that tells me that possibly it’s a financial thing more than anything else. James: I think so. I think you would definitely, if you’ll let them in, the people who are struggling to scrape it together, they’re also probably the quickest out the door because they are often not able to action. Whatever’s caused them to not be in a resourced position often weighs them down. It’s a fascinating thing, and I’ve done so many price experiments. The beauty of what I’ve got access to is hundreds of people who are running memberships. It’s not just my own membership. I love to peek behind the curtain and see what other people are doing. Like you’ve shared some stuff with us today that’s very, very interesting. And when I get to see how other people’s memberships are performing with price points and terms and we roll out innovations, the leveraged impact from that is quite profound. Moving on, Chris, do you ever get frustrated serving people who are at that very entry level? Chris: No, I don’t. No. I think that because I have a high-end coaching mastermind group as well, which allows me to serve people that are further along in the journey, but I like, for want of a better term, I like being the hero, you know? I like taking people from a five-figure to a six-figure business and from six to seven (obviously not as frequently). I know that you focus on that seven-figure and beyond and I think everybody serves different markets. For me, I love being able to help people come up with their initial monetization strategies or helping them figure out their book titles or what their next keynote is going to be about and hearing the feedback from them after they’ve done their fifth speaker session of the year and they’ve just been rebooked for another conference and all that kind of stuff. I mean, like I said, I’m having more fun now, James, than I have done in my entire career, doing what I do. And I think it’s because I’ve found the groove that I want to keep in, I want to stay in. I’ve found the content that I enjoy sharing. But most importantly, it’s because I’ve found the people that I truly appreciate the opportunity to serve above and beyond everything else. And so, no, I don’t get frustrated. In fact if anything it’s the exact opposite. I love it. James: Yeah, that’s a beautiful thing when you find your market. That’s the thing I found paradoxical, Chris, the paradox because you operate a substantial-sized business, yet you do enjoy bringing on those new people, and I think that’s awesome. I just, I definitely don’t have the patience or the interest level in it. I’m so clear on my perfect audience. They start at $10,000 a year with their own business. Because for that, they’ve already had to be through someone like your experience where they’ve gotten the fundamentals and they’ve gotten out of their own way and they’ve found something that converts and they’re in motion. And I would say the metaphor for this is like learning how to ride a motorbike. You know, they come to your place to find out how to hold it and turn it on and put it into gear and put the helmet on. When they’re already in first or second gear, rolling down the street, and they come to me, I’m ready to show them second, third, fourth, fifth, sixth, seventh, you know – like let’s get it onto the Autobahn. I love dealing with the seven-figure businesses who go to eight and I’ve had that happen multiple times now, where we go from a million or less to 10 million or more. That is an exciting place for me. James: But I think, hat’s off, Chris. You’ve got the gene to deal with it and people need someone like you in that early stage. Chris: I put together a bloody great event. Good is not a good-enough word. James: Epic. Let’s go with epic. Chris: There we go. Let’s go with that, right! James: The staging, the theming, the effort that goes into it, the curation of the event – it’s world class, really is very, very good, And it’s rare, especially if you’re used to going to conferences in North America, you’ve probably seen the bottom of the barrel in terms of what’s on offer, like very uninspiring events. You know, those ones with like 600… I’m not talk about Yanik’s events. He is a real showman. I’m just talking about some of the more dry ones where it’s really just you know chairs and desks and a curtain behind the stage, nothing flash. I think it’s worth putting a bit of effort into an event, but you are taking it to the next level. Tell me, is this where you are the most happy? Chris: Yes, without a doubt. James: I think you’re a performer, you’re an entertainer. You create atmosphere and it’s really good. The only other places I’ve seen that sort of thing is places like Mindvalley’s events where they’re very into the environment and the theming and the parties and things. But you know, good events are worth traveling for and make a difference. Chris: They do. They make a massive difference, not just from a learning perspective but also from a relationship perspective as well. I mean, I’ve met some of my best friends in the world at events that I wouldn’t have met if I hadn’t been there in person. Plain and simple. And when it comes to the events that I hold, my number one focus and everything that I do is to put on an event that I would enjoy myself. And you know, I’m a big believer – and it might sound a little cheesy and corny – but you know, your vibe really does attract your tribe. And I’m a big believer in that and I believe that anybody that comes to one of my events is going to be my kind of person. They’re going to want to have a bloody good laugh. They’re going to want to get up and dance a little bit every now and then, even if they’re crap like me. They’re going to want lots of networking and refreshments and good quality food and a great stage to look at for eight hours a day and amazing speakers to learn from. But they’re also going to want to be surrounded by other people that get there as well. And so, what I really focus in on is just providing an overall experience where people walk away and… let me tell you something – we collect a ton of video testimonials at our events, and I mean a ton. I try and get as many people as I can. My videographer is under very strict instructions to get as many testimonials at the end of each day as possible. And two words come up at my events from the attendees (and even the speakers, actually, for that matter) over and over and over and over and over again over the last five years, and that is “life-changing.” Those two words are said by genuine attendees, in testimonial format, more than any other. We know this because we’ve recorded them. We’ve recorded them in a spreadsheet. We can see exactly what words people are using to describe our events, and life-changing comes up more than anything else. And that makes me a very, very proud event owner. You know what I mean? It’s something that I enjoy more than anything else. And I have fun with it, James, you know? That’s the thing – I want people to have a good time, I have fun with it. When we opened up (and obviously if you weren’t there you wouldn’t know this unless you saw something on social), but when we opened up the Youpreneur summit in London last year in November, in September I flew to England to take care of a little bit of personal business. But when I was there, we took an entire day on location all over London to shoot video of me running around London in a Union Jack waistcoat and bow tie, as me apparently being late for my own event. And there was images of me running past Buckingham Palace and waving up at the balcony at the Queen. And then there was footage of me running around Big Ben and all the big landmarks of London. I was bloody knackered at the end of the day. I hadn’t done so much running in my life! But it was all cut together in this intro video that was played. Nobody had seen me before, this had happened on the morning of the first day of the event and the video starts playing and you know, it was cut beautifully by my son who is an amazing videographer and we put it all together and we played it and so many people have asked me to post it. We can’t, unfortunately, post it because we used the Justin Timberlake song to accompany everything and I don’t want to have problems from a copyright perspective. We’re still trying to figure out how to do that. But it was a great way to begin the event and it set the vibe for the entire event, for everybody to kind of laugh at me running all over London. And obviously when the back doors of the auditorium opened up at the Queen Elizabeth convention center, I walked in wearing the exact same Union Jack and bow tie. As if I’d just sort of run through the streets of London. Everybody loved it! See, that’s the kind of stuff that people will remember. I’ve now got attendees who have already pre-booked for next year saying, “How are you going to top it?” Like, what are you going to do, you’re going to land on top of a building like James Bond on a helicopter or something? Like, what are you going to do? So now people are expecting it. They’re anticipating it. And I’m figuring out how to be James Bond. We’ll figure it out. James: Just do what I did and change events. You know I’ve switched more into the Maldives Mastermind sort of event, which sell out a year in advance now. James: Life-changing is definitely along the same lines. Sure, you get to work on your business from a bean bag with a cocktail in hand, but also the sort of relationships you build up in a week with a small group in a tropical climate whilst learning. Chris: We saw that every year. Every year we saw that with TTT, mate, you were there. You saw it yourself. James: That’s right. But this is like a dozen people, so it’s really intimate and we even learnt how to breathe properly and just some fundamental life-changing skills. I love incorporating living with business content. So, I think you’re doing a great job with that and that’s why I wanted to ask you. So just a final thing to round out. This book of yours is the second book. Is that right, second book? James: What have you done differently this time than the first book? James: Just asking for a friend, you know? Chris: Yeah, sure, yeah. Well you can tell your friend, the first thing I did was I independently published it. So Virtual Freedom is traditionally published via a book deal with a publisher in the US and like a lot of first time, kind of rookie authors, I mean, you sign over everything. I screwed up big time, quite frankly. It did so well as a book, but it could have done so much better for me as the author than it has done. But I mean, from a business perspective this time around, independently publishing it, really focusing in on the quality of the design. Everything from the cover right down to all the pull quotes inside of it. We’ve sourced private printers, both in the United States as well as in the UK to serve those two big markets in terms of US, Canada and the UK in Europe. Obviously, we’re doing print on demand as well, with Amazon. We’re already working on a deal with another self-publishing platform, IngramSpark, to get it into stores. So, even if you independently publish, I think a lot of people think that if you self-publish a book that you can’t get it into bookstores – that’s total rubbish. You can. You just have to work harder to make it happen. And anybody that knows me will know that I don’t shy away from a little bit of hard work. And so, you know, it’s been a really interesting process. What I really love about it more than anything else is that I now have complete and utter control over what will probably be my last business manual-type book. We might expand on it, we might update it at some point in the future, but at this point in my career I don’t see myself writing another kind of how-to type book. This is the second one and I truly believe it’ll be the last one. And it’s just nice to know that I control it completely and if I want to change certain aspects of it without any problems, I can do it without having to get lots of approval and all that kind of stuff. But when I look at my royalty statements of Virtual Freedom and realise that 83 percent of all copies of that book have been purchased on an Amazon website, you kind of think, well, do I really need to go through all the rest of it, try and get it into stores and all the rest of it? So that’s been a big difference. The way I wrote it was very different this time around as well. With Virtual Freedom, I sat and typed out every single word. With Rise of the Youpreneur, I used an editor. And we did 12 hours of interviews, we got them transcribed, and then we reworked all of those stories and takeaways and value bombs and strategies and everything else that I dropped in those discussion points. We reworked all of the text into a genuine book-type text, and we pulled out all these great little one-liners, which will end up being tweetables around the launch of the book and in keynotes at some point in the future and all this sort of type of thing. So, it’s been a much different journey this time around, but I’m really excited to see how it does from, obviously, a sales and distribution perspective. But more importantly, the one thing that really fueled me with Virtual Freedom and putting that out was the stories that I would hear back from people that had changed the way that they run their businesses and have grown a team and become freer as an entrepreneur. And I just can’t wait to hear similar types of stories six to 12 months after somebody reading Rise of the Youpreneur. James: Yeah, it is pretty awesome putting a book out and seeing people talk about how they’ve got results from it or they’ve changed their routine or they’ve had a real wake-up call. The exact same thing is happening to me right now. We’re one month into it and I can tell you it was quite shocking to look at Amazon royalties as a self-publisher. I never even thought the book would be a money maker. It appears you can actually make money just by publishing a book. Chris: There we go. Exactly. My very good friend, Hal Elrod, who will actually be doing the closing keynote at this year’s Youpreneur summit, he published a book called The Miracle Morning. Self-published, did very, very well, sold tens of thousands, hundreds of thousand copies, quite frankly. And then had traditional publishers coming to him, saying, “We want this title. We want to distribute it for you in stores. We want to get it in there and we’ll allow you to retain your audio book rights and your yada yada yada yada yada…” And he’s now cut deals with a number of different publishers around the world. I mean, the guy is making so much money from a book, it’s almost sickening. It’s sick. He’s selling 10000-plus copies a month. James: I’d use him as a case study for how you can get a lot of result for a tiny little idea. You really could summarize his whole thing in a couple of bullet points. Right? I don’t want to oversimplify it, but let’s be frank. There’s not much to it, is it? It’s just a few bullet points that he spends an hour telling stories to get to the point. I watched an entire hour-long presentation and I wrote down two lines. It was pretty thin on content. Chris: With somebody like Hal and that type of content, it’s not necessarily a how-to type learning thing. James: People love the story. There was nothing in there at all for someone like me except for how incredibly informative it is of, you could do so well off so little if you tell a good story and you publish it the right way. So I mean, congratulations to Hal and well done. I found the exact opposite problem. I’ve got 10 years’ worth or probably 20 years’ worth of content we had to try and chunk into a book, where we threw away most of the ideas. There’s not a single wasted word in my book. And no one knows about me. So, he’s clearly doing something right. I’m definitely going to pay even more attention to what he’s doing. I’d already stumbled across it and thought it was fascinating. But correct me if I’m wrong, there’s really not that much to the method, right? Chris: No. As a book, as a message, it’s pretty simple. Wake up early, exercise, read, meditate, eat healthy, exercise a little bit. Whatever it is. James: Yeah. It’s a good thing that’s what I’ve had on my Excel spreadsheet for the last 10 years. Chris: Understand, though, that… I mean, this is where I show him an incredible amount of respect. He’s seen a gap in the market for that type of inspirational, motivational type of message. He has packaged it in a way that is very, very consumable and ridiculously shareable. It stands to reason, if you wake up early or earlier than you usually do, and you exercise and you eat well and you meditate and you spend a bit of time on yourself each day, you are going to, as a direct consequence of all those actions, feel better about yourself pretty quickly. It’s not going to take years, it’s going to take maybe a month, maybe a couple of weeks of consistently doing it. And so what do you do? You start talking about it with the people around you and you know that’s where I give him a lot of respect. He’s serving people in the right way and he’s doing it in a way that is incredibly valuable and very, very shareable. And that’s how you build a thriving multimillion dollar business, you know? James: And that’s really what I’m saying too. I respect how much he’s done with such a simple idea. He is a genius, obviously. James: No, I don’t. I don’t want that to come across. Chris: No, in a jokey way. So I was just using it as an extreme example of how little content you could actually put in something for it to still be well-received in the market. James: I think probably a lot of what you’re talking about with Youpreneur is creating your own story about yourself and broadcasting that, like magnifying it with the social media channels. Like, we tell ourselves a story about ourselves and you’re just saying, publish it. You know, it’s not rocket science. It’s genuinely not rocket science. But it gives you an opportunity, like I said at the top of the chat here, where you can if you do it right and you do it for the right reasons, and for the right people, you can future-proof yourself like this. And you know, the beautiful thing about that is that as your varying interests change and you decide to pivot at some point in the future, the chances are that your people will pivot with you. They’ll follow you. Hence the future-proof aspect of it. Because you are the mainstay of the menu. You’re the steak and chips that’s never gonna be taken off the menu, it’s always going to be there. Because you’ve become their favorite, whatever that favorite is – podcaster, coach, YouTuber, whatever. It doesn’t matter. You’ve become their favorite, and they love you for who you are, and they want to stay tuned to what you are all about and how you can continue to help them. And a lot of the time, it’s just as simple as living your story as loud as you possibly can, you know? James: Well Chris, on a final note I just wanted to say, love the cover. Love the cover of the book. Chris: Thank You. Appreciate it. Chris: It’s because I’m on it, isn’t it? James: Well, you know, we ended up with a similar pose, with a Tyler shirt. James: …staring at the camera full on. And that’s what my editor wanted. Chris: And that’s exactly what mine wanted as well. And I remember saying to myself, I have no problems having my photo taken, I’m fine for that. But being the only one, right? And you know, it’s different if you’re posing with other people and you’re looking at the camera, that’s fine. But being the only one looking directly into the camera lens for, I guess probably the shoot was maybe 45 minutes or so – I dunno know about you, but I felt really uncomfortable about it. I didn’t know how the shots were even going to turn out. It was kind of a weird thing. I’ve never done this before. James: Was it a Filipino team? Chris: It was a Filipino team, and they were great. I mean, we shot it at my coworking space here, and it was an easy shoot. I felt great. And you know, I wasn’t uncomfortable or anything. But it was kind of a weird feeling to just be the only one on display. Chris: No, not on the front of my bloody book, mate. James: And you’ve got to do the V finger thing. Chris: Oh yeah, you’ve got to do the V-sign, you’ve got to do that. Now I was very happy with the way the cover came out. I was up until really I saw, when I saw the final, the actual final fully-edited cover, I was 50-50. We even had a few concepts put together for a full-graphic cover like what we did with Virtual Freedom as well. But you know, after speaking to a few close friends and mentors, pretty much everyone told me that I needed to be on the cover of the book as the original youpreneur myself. James: You have to be for Youpreneur. It’s not even a question. Chris: Yeah, yeah. So there you go. But I’m glad you like it. Chris: You look very handsome on yours as well. James: It’s always good chatting. We’ve covered a range of topics today, just a quick recap. We’ve talked about your book, Rise Of The Youpreneur: The Definitive Guide to Becoming the Go-To leader in your Industry and Building a Future-Proof Business. We even talked about what future-proof means. We talked about live events. We talked about publishing your second book. We talked about your community and what’s involved in that. We talked about the pros and cons of having a business that you could sell or not, which one’s faster or easier, and how do you protect it? We’ve talked about, gee, all sorts of things, Chris. It’s been a wonderful journey. Churn and all sorts. So, if you want to find out about Chris’s book, grab it. I’ve read through it. It’s got some really nice quotables. Especially, it backs up a lot of the things that I talk about in terms of building your own asset and the recurring subscription model. When I first saw the book, I was a little bit worried that it might teach you to be single-source dependent and I was pleasantly surprised to find out that you actually have a very similar approach to me and for people who really know Chris, there is that actual business background lurking away there. So it comes from a place of knowing. Chris, always a pleasure. I guess I’ll see you on the Instagram. James: And thanks for joining us today. Chris: It is my pleasure. Thanks for having me back again, man, appreciate it.